These rugs are beautiful and wash well. 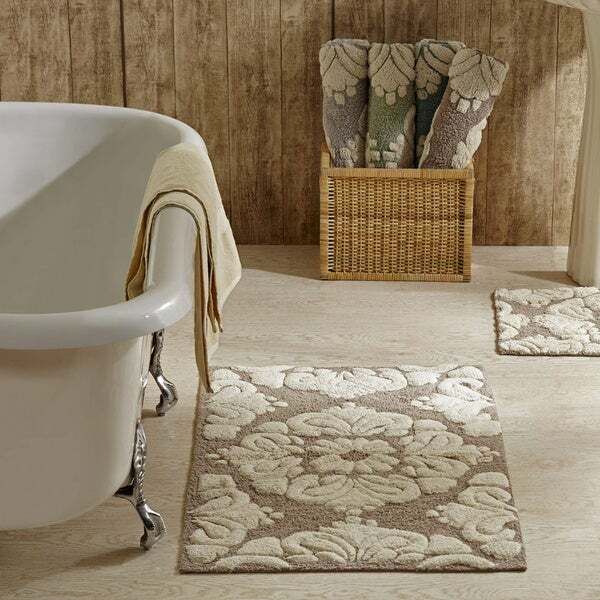 Outfit your bathroom with this set of two attractive, affordable bath rugs from Better Trends. Available in multiple size and color options to best meet your personal decor needs, these stylish bath rugs features a subtle non-skid backing and plush pile. To top things off, these rugs are conveniently machine washable for easy care. Rug sizes may vary slightly from listed dimensions. Taupe on picture, was not the same when received...it was grey. Awkward size, in other words, sides were not even. I was very disappointed when I finally opened the package to lay my new rugs down. They appeared to have been cut from a carpet...the edges were uneven and not true to size. Example: orig. 17x24 was 18x26; orig. 24x40 was 28x42. I would not recommend this product. If I had checked this item when I first received it, I would have returned it immediately! As it stands, I trusted that it was going to be ok. Items purchased in the past have always been satisfactory. I saw these rugs online, and figured after reading positive reviews to take a chance on inexpensive rugs. 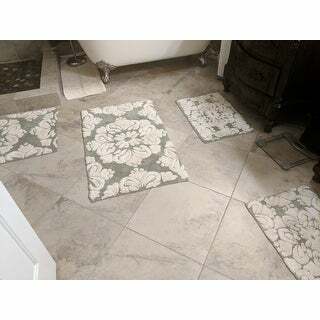 I was not disappointed, and highly recommend these rugs for bath, kitchen, entry or hallway. I ordered these in blue, and they are such a calming/beautiful color; light/muted aqua/teal blue and ivory. If you have grey blues, this will not be the right shade. For anyone decorating with aqua or teals these rugs are perfect. Rugs are thick and color true to image. The only thing that I don't like it that the non-skid backing does not keep the rugs in place well. Should have made the backing a little thicker to prevent slipping. Not at all what I wanted. Color is too faded and the rug isn't thick enough. I was looking at a larger bath rug at least 40 inches in width when I came across these rugs. They are good quality and very attractive. The extra smaller rug came in handy too. I am coming back to order another set! These are great bathmats. They don't skid around even though they don't have that non-stick stuff on the bottom (i.e. they're not coated in rubber underneath). Beware: the first couple of time you wash them, wash them by themselves. They shed a TON the first few times they're washed but it seems to subside after a while. I was tired of the same old department store bath rugs and don't like the floor tile color in our bathroom, so these were a stroke of luck. The tan blends with the tile, and the cream gives the floor a little life! I am quite certain that they'll shed a LOT when washed, so only gave it a 4-star, but a good shake and clean the lint trap, right? Additionally, the backing isn't that rubber stuff that disintegrates in time. A huge plus for me. I measured where I needed rugs, and bought two different sized sets to accommodate, lining the two small ones up together for across the tub. Perfect! I love the color and the look of this set. I wanted something besides the boring, solid bath rugs usually available. This is a bit lumpy underfoot because it's sheared cotton with a high/low finish. Not painful or anything, but you can tell it's not a smooth bath rug. I love it anyway and it washes like a dream. Would not recommend. They shed and do not wash well. These appeared to be to be nice rugs and where beautiful however I only gave them 3 stars due to the fact of them being stain with ink or dye. I did return them so this is all the info I can contribute to. Beautiful carpet! It is sturdy and thick! It goes perfectly with my Decor and holds up well. You can beat the price and functionality and style! I bought 2 sets because my bathroom is large. Overall the quality is good and the rugs were in great shape. Great for the price. Very attractive mats for the bathroom floor. I think these are very pretty, however, until my daughter moves into her apt and stops using them, I am going to have to put them away and save them. If the person using that room isn't neat, you will be washing these at least twice a week. I do recommend for a non -used or lightly used area for these mats. That are very pretty however; so it is worth the wait. These are very good quality rugs and wash extremely well. I purchased two sets and the medallion design adds so much to their beauty. I use them in my bathroom but would do just as good in any room. The non-slip backing is great. Keeps them in place. A great set of rugs! Stay in place on the floor nicely and hold up well in the washer and dryer! High quality, looks better in person. I absolutely love this rugs ,they are plush and soft and feel great under you feet not like the flat rugs you get from a discount ,they look very luxurious.this was a great find ! Looks beautiful ! !And feels pretty soft. That’s my half bath perfectly. Very nice large bathroom rugs. "Is the blue one a tourqoise or a baby blue? And also when you order them is it possible to get two of the medium sized in the same size or do you have to order two of two different sizes??" They're only available in the two different sizes. "Are these rugs thick and plush?" 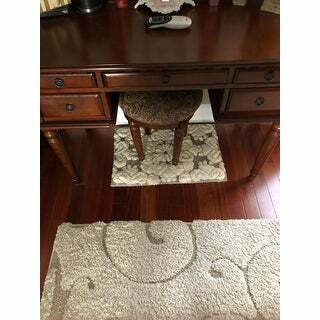 Rug has a soft sculpted texture, but I do not recommend you wasting your money;. This product is a hit or miss. When I first received it I failed to examine it right away. But, when I was ready to place it in my bathroom, I found out the color was not as pictured, and both sizes appeared to be cut from a larger carpet, uneven, and not true to size. I hope this helps. "What color is "sage"? I am looking to purchase the brownish one." "When you wash them do they fade?" I have washed mine a couple time and they have held up perfectly. No they still look great! The flowers fluff up but will settle back down when you walk on them. I do cold wash and line dry only, no dryer, still love them. "do you have them available in taupe - or will they be available soon"
The taupe is not available at this time and we do not know if they will be restocked. "Is the sage rug more green or turquoise?" The sage is more of a green with a tan hue to it.